File photos The Kiddie Bale Toss will be held 2 p.m. Sunday, Sept. 30 at Flag Plaza. One of the most popular events, Saw Mill Demo, will be held in the Thresing Area 2 p.m. Friday, 10 a.m. Saturday and 11 a.m. Sunday. All sorts of tractor events will be held this year, including Tractor Pull, Tractor Cranking Contest, Tractor Slow Race and Kiddie Tractor Pull. XENIA — Old Timers Days is coming back to the Greene County Fairgrounds Friday-Sunday, Sept. 28-30, this time with a new attraction: steam engines. “We haven’t had the steam engines out there in years,” said Lester Davis, president of Old Timers Club. The steam engines will arrive to the fairgrounds on a semi, and will stay for the three-day show, allowing children and families to learn about how they operate. “They all operate on firewood and coal, which burns the steam. The steam makes the motor run,” Davis said, adding that it’s been about 25 years since the event has showcased steam engines. They’ll also blow a noon whistle every day of the show. But steam engines won’t be the only machinery on display. Folks will also be able to check out a thresher, saw mill, and all sorts of tractor events. At least four threshing demos will happen throughout the weekend on a machine the club has had for years, demonstrating the process of separating grain and straw from wheat. 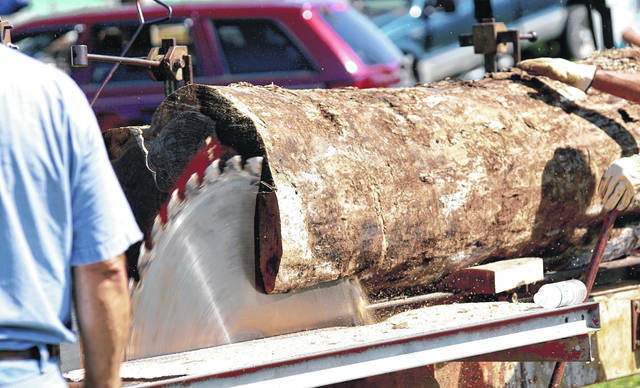 Perhaps one of the most popular events — a saw mill demo — will also happen once a day. Observers will have the opportunity to watch the machine take logs and cut them into lumber. A lumber auction will then be held on Sunday. Beyond these events, kids will enjoy a hay ride, big wheel race, kiddie tractor pull, kiddie bale toss, pie eating contest, games and more. Each child participant will leave with a ribbon. But Davis noted the event is for all ages, and people from all over the state and surrounding states will attend. Attendees will have access to all sorts of vendors and local food, a flea market, crafts, entertainment, and more. The weekend will begin with opening ceremonies on Thursday. FFA kids will drive their tractors to school on Friday, stopping by the fairgrounds for breakfast, where some Old Timers will jump on their tractors and join the drive. Later, the dining hall will be open for beans and cornbread and homemade ice cream. Saturday will begin with a pancake breakfast, open to the public — $5 per person for unlimited pancakes and sausages. The parade at the fairgrounds will begin at noon. Activities will end Sunday with the golf cart raffle and quilt raffle. A 2013 road-ready golf cart will be raffled, Davis said. Tickets will be sold for $1 a piece or 6 for $5. The fairgrounds are located at 120 Fairgrounds Road. Admission to the event is $4 for adults. Children 12 and under are free with a paying adult. 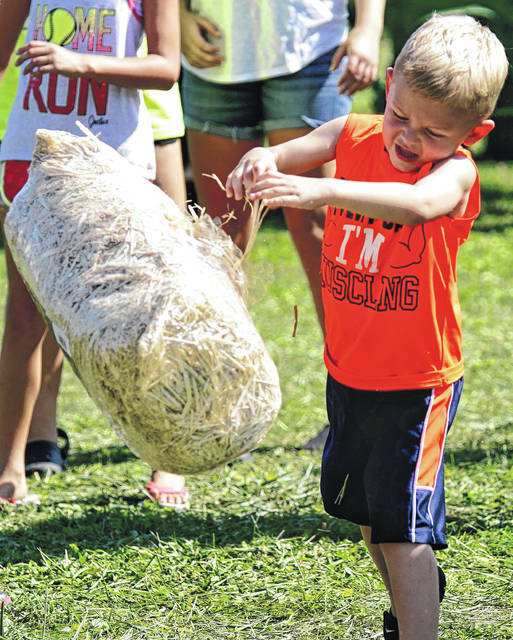 https://www.beavercreeknewscurrent.com/wp-content/uploads/sites/49/2018/09/web1_Bale.jpgFile photos The Kiddie Bale Toss will be held 2 p.m. Sunday, Sept. 30 at Flag Plaza. https://www.beavercreeknewscurrent.com/wp-content/uploads/sites/49/2018/09/web1_Lumber.jpgOne of the most popular events, Saw Mill Demo, will be held in the Thresing Area 2 p.m. Friday, 10 a.m. Saturday and 11 a.m. Sunday. 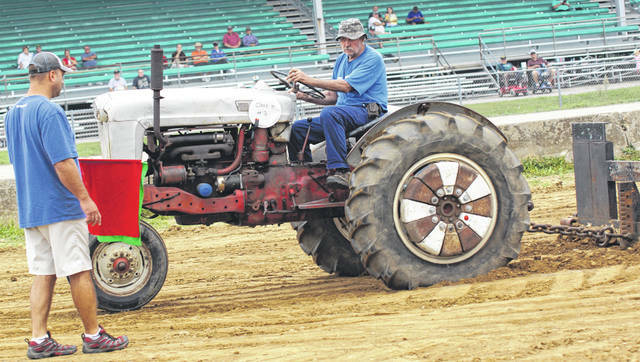 https://www.beavercreeknewscurrent.com/wp-content/uploads/sites/49/2018/09/web1_Tractor.jpgAll sorts of tractor events will be held this year, including Tractor Pull, Tractor Cranking Contest, Tractor Slow Race and Kiddie Tractor Pull.